Home > Books > Star Struck! Maximus I.Q. is stealing the stars from the sky! 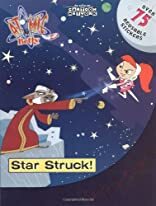 It's Atomic Betty to the rescue as she leads her crew on an outer-space adventure straight to the heart of Maximus's lair, where they find a glittery stockpile of stars awaiting rescue. About Atomic Cartoons (Illustrator) : Atomic Cartoons is a published illustrator of children's books. A published credit of Atomic Cartoons is Star Struck! (Atomic Betty).